Mysuru: Environment activists and nature-lovers from various organisations like Mysore Grahakara Parishat (MGP), Save Wildlife Organisation, Ahimsa Vedike, Parisara Samrakshana Samithi and Prakruthi Savayava Krishikaru staged a protest this morning in front of the Deputy Commissioner’s Office against the proposed elevated corridors that cut through Bandipur Tiger Reserve connecting Karnataka and Kerala. 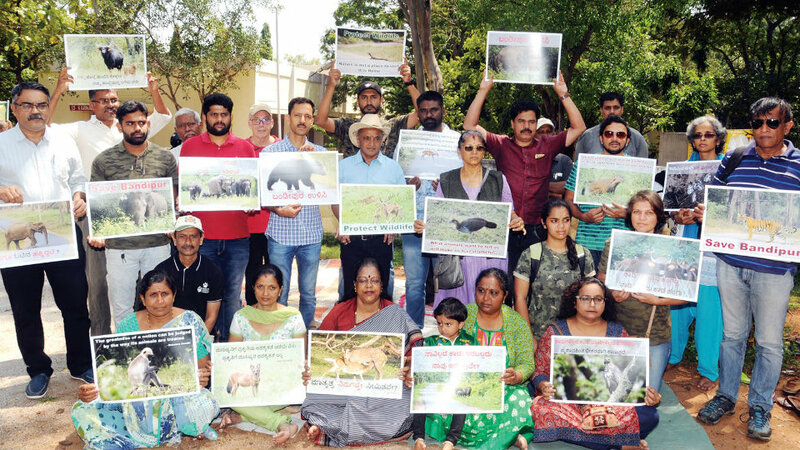 Holding placards with slogans ‘Save Bandipur’, ‘Save Wildlife’ and quotations from Mahatma Gandhi and Poornachandra Tejaswi on wildlife, they drew the attention to the damage that could cause to the wildlife and its environs if the night traffic ban between 9 pm and 6 am, is revoked. The activists including Maj. General S.G. Vombatkere (Retd.) and Shobhana of MGP, Nanjaiah of Ahimsa Vedike and D.H. Tanuja of Keystone Foundation and Nature Conservation Foundation have pointed out that that the number of road kills had drastically come down since the night traffic ban was imposed in 2009. The decision for night vehicular ban was passed in High Court and upheld in Supreme Court, they said. The protesters said that though Karnataka was firm on its stand of not lifting the night ban or allowing for the construction of elevated corridor in Bandipur, there were a few lobbies who were interested in constructing five overhead roads on an area which is declared as eco-sensitive zone, to further their business interests at the cost of wildlife. Speaking to Star of Mysore this morning, Tanuja said that she had told the caller that this was a democratic country and everyone had the right to protest. “I also invited the person who threatened me to come to the protest site and present his side of the argument. He agreed to come to Mysuru. However, I have not lodged any Police complaint against him,” she said. Later, asked if he had come to the protest venue, Tanuja said that he did not turn up. Keralites, stay away from our state. Enough is enough. You are already causing menace in our state. Go to hell with your mafia!